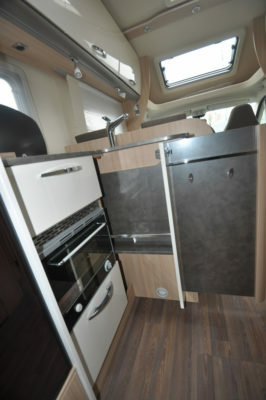 Well, you can have all this, and a little bit more, with this new model from Germany’s Bürstner. It’s the top model in an all-new range, with Lyseos taking over where Ixeo Times left off – if anything further reinforcing Bürstner’s reputation for not being afraid to offer something a little different. Prices start pretty competitively, too. In truth, however, you’ll want to top it up with some of the huge choices of options available. 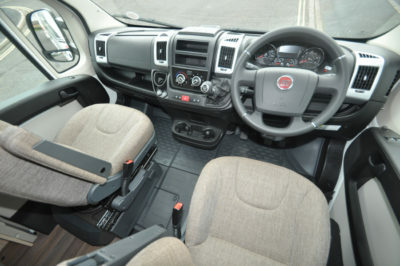 Various packs offer the best value, for example, the £2,375 Chassis Pack Manual gives you passenger airbag, cab air conditioning, cruise control, electrically heated and adjustable mirrors, ESP including ASR, hill holder and traction plus and captain’s seats upholstered to match the living area. Realistically, by the time you’ve tailored things to your needs you’re most likely looking at a price in the mid-£50,000s. That’s still great value (and already most manufacturers are hinting at significant Brexit-induced price hikes from 2018 season onwards). There are also almost endless interior configurations, based on a choice of two furniture finishes and mixes of upholsteries and infill pieces. The layout remains a constant, of course. At the back, that lounge is something to behold. 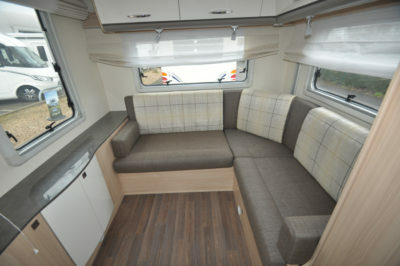 Seating is L-shaped, with a large picture window over a sideboard-style unit along the offside. 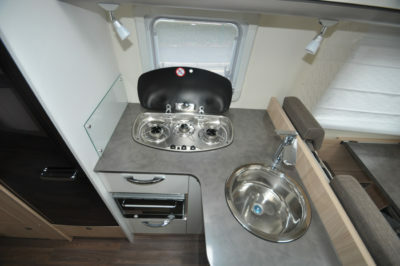 A neat little coffee table on castors wheels out from the offside settee base – it’s just one of a number of really clever features in this motorhome. There’s certainly no stinting on legroom, and you barely notice the presence of the huge bed overhead – electrically-operated, it effortlessly glides into position for sleeping. Remove the seat backrests and it comes down low enough to warrant just the use of a slide-out step to help access. That one-piece mattress is supremely comfortable, too. Also, even with this main bed down, you don’t lose out on the lounge. There’s still the front seating and table, with extension, up the front, which could accommodate up to five. 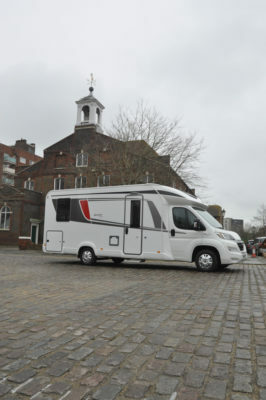 Although a two-berth initially, the options can take you up as high as five. You’ll probably want a chassis weight upgrade if you’re going to push for the maximum – the initial 410kg payload isn’t the highest either (especially if you’re going to pile on the options). Bear in mind, also, the 744 only offers travel seating for four. If you’re expecting a squeeze on the kitchen and washroom between all this, you’re not totally wrong. The former makes the most of things by being L-shaped and using space-efficient fittings such as the three-gas-rings-in-a-line hob. 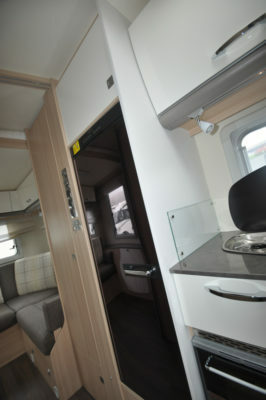 There’s also a narrow-bodied fridge with removable freezer and generous 145-litre total capacity. 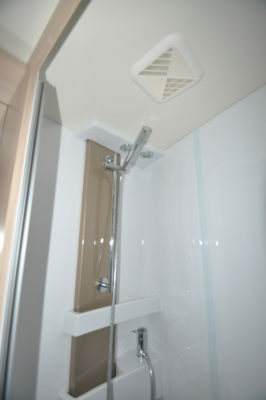 The washroom majors on a separate, plastic-lined shower cubicle, with trays for shampoo bottles and two diagonally opposed plugholes. 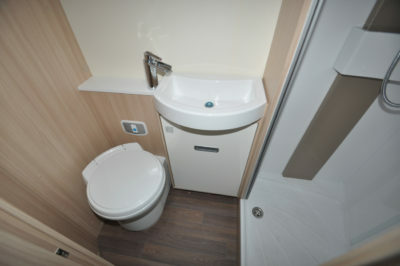 Thetford’s almost-ubiquitous swivel-bowl toilet is here, plus there’s space for a small-ish basin. Storage hasn’t been forgotten, with upper and lower lockers. Throughout this Lyseo, the good ideas keep coming. There’s a flat floor throughout, with standing height of 2.05m. Lockers have easy-to-operate catches. The external service hatch means hooking up is that bit easier. The interior lights are on rails, for optimum adjustability. Gas isolator valves are easy to reach (and consequently, more likely to be used). It goes on. All this just leaves you to sit down with the brochures and select your extras. Maybe that rear lounge is the ideal starting point after all. There’s more information on the Lyseo range on the Bürstner UK website. 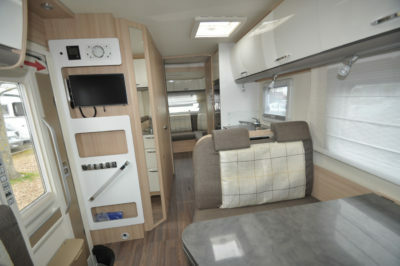 Find out more about insuring this or a range of other motorhome types at our motorhome insurance discounts page. Safety & security Security and Safety Electronic immobiliser, ABS, central locking (cab doors only). Key options 150PS engine upgrade (£2,396), chassis upgrades (from £153), Chassis Pack Manual (£2,375), Fiat Interior Design Pack (£320), Ambient Pack (£375), Winter Pack (£1,235), Light Pack (£233), Sound Pack (£171), Hartal Premium XL door (£798), XL Skyroof (£572), Truma Combi 6E gas and electric blown air heating (£605), flat screen TV holder (£91), leather upholstery (£1,371), metallic cab (from £742), Pioneer AVH-X5800DAB with rear-view camera (£1,041). “A brilliant bed”, but what size is it please? As an additional aside, beds are always important and it would be extremely useful if bed sizes could become a regular part of your Factfile with every review. Hi Mike, the bed size is 2.00m x 1.45m. Our mini reviews simply provide a snapshot of a particular vehicle and its highlights so we tend to quote dimensions only where a bed is notably long, or, indeed, short. All manufacturers quote bed dimensions on their websites and/or in their brochures. 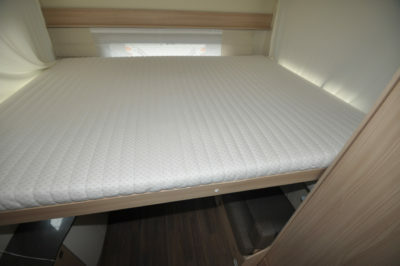 Some reviews show it as having 2 beds like this one from Practical Motorhome https://www.youtube.com/watch?v=mhwAz0-faMI I must be missing something. The rear bed is standard. A second electric drop-down bed over the front lounge is an optional extra.